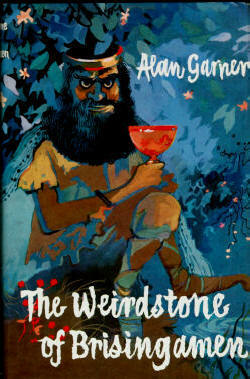 Today is the 50th anniversary of the publication of Alan Garner's The Weirdstone of Brisingamen. When I was seven years old, our English teacher sat us down (legs crossed) on the tiled floor of our classroom. She read the first chapter of The Weirdstone of Brisingamen to the class. We were, to a boy and girl, spellbound. Then she shut the book up and told us to finish it for ourselves. I rushed straight off to the library and nabbed a copy; and that was the day I became a lover of books. Hats off to you, Mr Garner. Wow, that's bizarre. I haven't seen that book since I was a kid! I used to read it while listening to Stormwatch. Must dig it out... I still have it here somewhere. The Owl Service is pretty good too. And Elidor, come to think of it. Yes, both beautiful books. Better still, in my opinion, are his later works from his early period -Red Shift and The Stone Book Quartet. I'm now approaching 58 years old, and Weirdstone is still my favourite book, bar none. Wonderful stuff.